Since our company’s establishment in 1933, we have constantly worked on pioneering architectural projects as a metal architecture expert. Notable examples include the titanium sphere of the Fuji Television building in Odaiba, the 100M tall titanium tower in Mito City, and the interior and exterior of high-end brand shops in Ginza. Our history has been an integral part of the history of famous architecture in Japan, from the Tokyo Tower observation platform, long ago, to the metal panels used in the observation platform in the recently constructed Tokyo Sky Tree. All of our products are made-to-order, tailored to customer needs, so we have been involved in many pioneering projects. While we have encountered many challenges, these experiences have helped build our expertise, serving as an asset which shapes Kikukawa today. Our strength lies with our ability to provide comprehensive metalwork solutions. In recent years, the North American and European style of batch consignments have become more common. In response, Kikukawa has restructured itself to explore the option of working with non-metal materials. We strive to meet the needs of our clients to ensure customer satisfaction. This transformation is supported by our approach to take on any and every challenge, a prevalent philosophy since our firm's foundation. We will combine this spirit of “Never Say No,” developed through our metalwork experience, with other materials, further refining ourselves as we surmount new challenges. 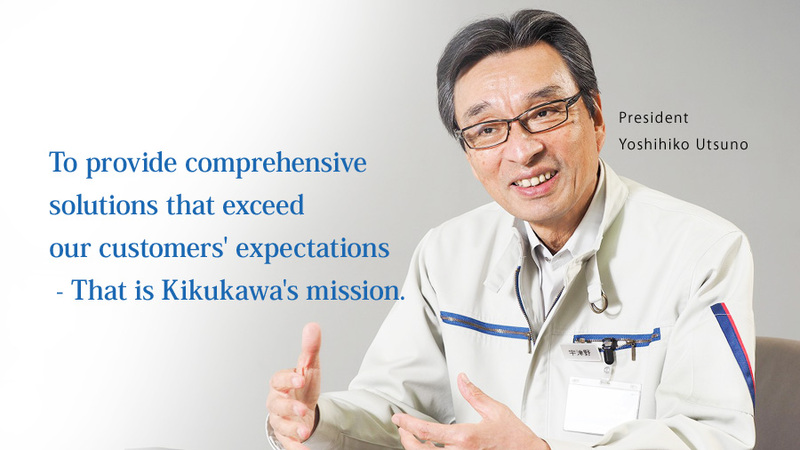 Kikukawa's mission, to provide comprehensive solutions to our customers, has paved the path to hone our technology and will continue to forge our way to the future. KIKUKAWA, the Metal Architect, engineers dreams, values and aesthetics for the 21st century.